American Tractor Lights has been helping tractor restorers and other owners of older tractors get it "right" when fixing broken lights. "We're kind of the Lone Ranger for American-made lights," says Dale Smith, owner of the Ellsworth, Ill., company. American Tractor Lights manufactures lights for all tractor makes built between 1939 and 1972 - Allis-Chalmers, Case, Cockshutt, International/Farmall, John Deere, Massey, Minneapolis-Moline, Oliver and more. "We're known for high quality and that our parts will fit right in place of the original," Smith says. He notes that cheaper imports are available but they often don't fit as well and sometimes don't even work. Smith takes pride in surviving the challenges of making a U.S. product. His company's website has helped grow the business beyond the U.S. to Canada, Australia and Europe, where the popularity of restoring tractors is exploding. Besides selling complete headlights for $63/each, American Tractor Lights sells components, reflectors and rear lights. They also do custom production work, with a minimum of 2,000 lights. They recently filled a large order for lights for Oliver tractor models, for example. Contact: FARM SHOW Followup, American Tractor Lights, P.O. Box 112, Ellsworth, Ill. 61737 (ph 309 212-7585; www. american tractorlights.com). Where To Buy Antique Tractor Lights TRACTORS Antiques 32-1-38 American Tractor Lights has been helping tractor restorers and other owners of older tractors get it "right" when fixing broken lights. "We're kind of the Lone Ranger for American-made lights," says Dale Smith, owner of the Ellsworth, Ill., company. American Tractor Lights manufactures lights for all tractor makes built between 1939 and 1972 - Allis-Chalmers, Case, Cockshutt, International/Farmall, John Deere, Massey, Minneapolis-Moline, Oliver and more. "We're known for high quality and that our parts will fit right in place of the original," Smith says. He notes that cheaper imports are available but they often don't fit as well and sometimes don't even work. Smith takes pride in surviving the challenges of making a U.S. product. His company's website has helped grow the business beyond the U.S. to Canada, Australia and Europe, where the popularity of restoring tractors is exploding. Besides selling complete headlights for $63/each, American Tractor Lights sells components, reflectors and rear lights. They also do custom production work, with a minimum of 2,000 lights. 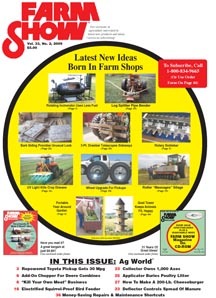 They recently filled a large order for lights for Oliver tractor models, for example. Contact: FARM SHOW Followup, American Tractor Lights, P.O. Box 112, Ellsworth, Ill. 61737 (ph 309 212-7585; www. american tractorlights.com).